Colorado Mountain College graduate and student speaker, Conrad Kropf, speaks to fellow grads, family and faculty at the 2017 CMC graduation. A nationwide study found that college is less affordable than it was in 2008. CMC is working to change that in Central Colorado with dual enrollment and Early College programs. 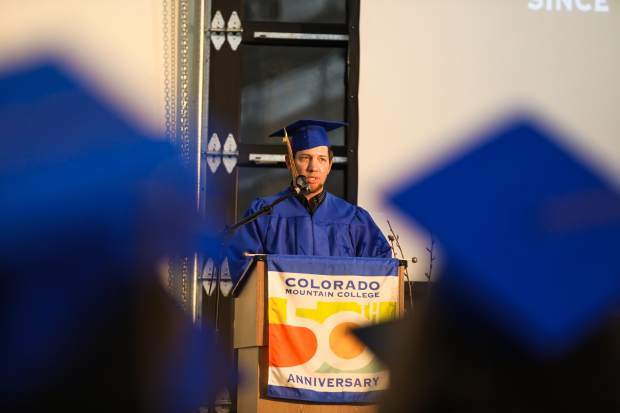 CMC is celebrating its 50th anniversary..
By the end of this decade, 74 percent of the jobs in Colorado will require at least two years of college, which means Colorado will need the nation’s third-most educated workforce. Unfortunately, Colorado ranks 31st in the College Affordability Diagnosis, a state-by-state comparison of the policies that affect families’ abilities to pay for college. The University of Pennsylvania Graduate School of Education, Vanderbilt University and the Higher Education Policy Center studied college costs in relation to family income level. Around central Colorado, Colorado Mountain College is working with school districts to ease the crushing cost of college. “We can be the head of the fish, not the tail, in the state of Colorado,” said Carrie Besnette Hauser, president and CEO of Colorado Mountain College. More than 100 high school principals, counselors, school superintendents and CMC staffers gathered to talk about dual enrollment — also called concurrent enrollment — through which high school students can earn free college credits. The program is available in 45 high schools around CMC’s 12,000-square-mile service area. Also on the table was Early College, a program pioneered by Phil Qualman, assistant superintendent of student support services for Eagle County Schools. Students remain enrolled in high school for a sixth and seventh year. The state picks up the tab for their college classes because, technically, they’re still high school students. In exchange, the students must complete their high school diploma and earn an associate degree or 60 transferable college credits. In the program’s first year, 32 students are enrolled. The school district wants to triple that number next year. Local high schools and CMC launched their concurrent enrollment program in 2002-03, when 181 Eagle County students earned 1,700 college credits. By fall 2017, that number was up to 658 high school students earning more than 3,500 college credits through CMC’s Edwards campus. In addition, several Eagle County students have taken so many concurrent enrollment classes that they graduated with an associate’s degree from CMC at the same time they graduated high school. In Garfield County, CMC’s Rifle campus introduced a Friday Career Academy. High school students came to the campus to take concurrent enrollment courses. The first year the campus offered the program, 65 high school students earned professional certificates, such as nurse aide, culinary arts, welding and solar installation. Tuition increases in Colorado and other states’ public colleges average 7.2 percent a year and have outpaced the state’s efforts to expand financial aid. Also, with spiraling college costs, that student financial aid does not go as far as it used to. That leaves student loan debt as one of the only options for low- and middle-income students who want to attend college full time. The total amount of student debt now stands at $1.3 trillion, more than all car loans or credit card debt. You say you’ll work your way through? You’ll work more than 20 hours a week to cover the costs. “Unless we make college affordable for people of all financial means, opportunity through higher education will be a false promise,” Finney said. So we’re losing ground on college affordability, especially for students of modest economic means. The results are obvious. “Far fewer of these students will enroll,” said Vanderbilt’s William Doyle, one of the study’s authors. Researchers have been examining the impact of price on college attendance for nearly 50 years, Doyle said. The arithmetic is simple. Doyle also found that while financial based aid barely changed between 1996 and 2012, non-need-based financial aid for high-income students skyrocketed 450 percent.